More important than the US GDP number, more substantial than the February jobs report, what will linger for longer in the public consciousness is China’s trade data. It seems as if the big drop in exports has garnered the most immediate attention, I suspect that won’t be the case moving forward. There are more important trends being captured where the data wasn’t so splashy. The month of February is always a tricky one, what with Golden Weeks moving around every calendar. As such, the latest numbers are skewed at least on the one side. That’s a bad result, not indicating much that’s good about external demand, if not quite as shocking as -20%. The real concern is on the import side. As a monthly change, -5.2% in February doesn’t seem all that bad especially considering all the same factors. Rather, you see the problem very clearly in what is now a continuing negative trajectory. 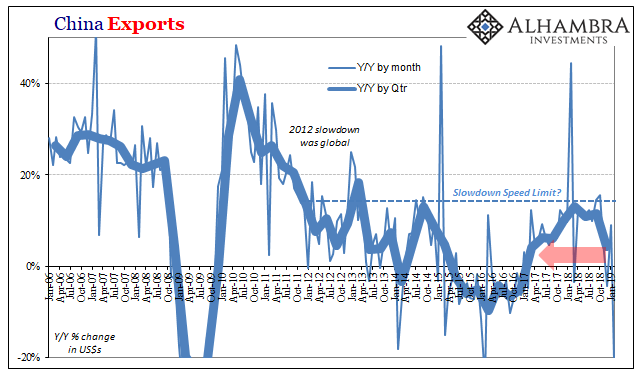 Imports are down each of the last three months, compared to 20% growth (which was already low) previously. The timing also grabs one’s attention; the very clear shift in economic activity registers right during that same window we’ve been talking about. October-December was a global market shakeup, and here are the Chinese establishing yet again what was certainly the real economy impetus behind it. Only, it hasn’t stopped. 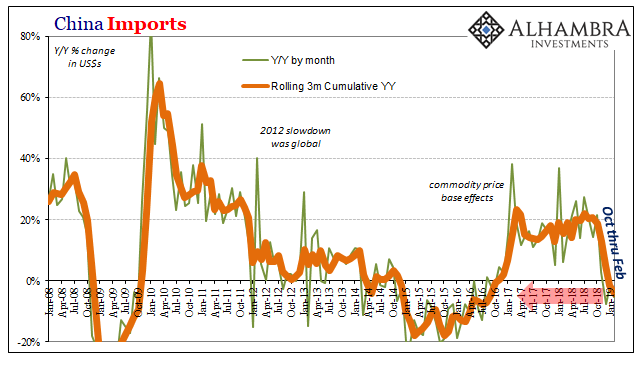 Whereas some minor reflationary sentiment has crept back into things in January and February (a little less so later in February), some hope about monetary pauses or whatnot, Chinese demand for foreign goods has not rebounded. The world depends on China, and so does much of US capitalism.